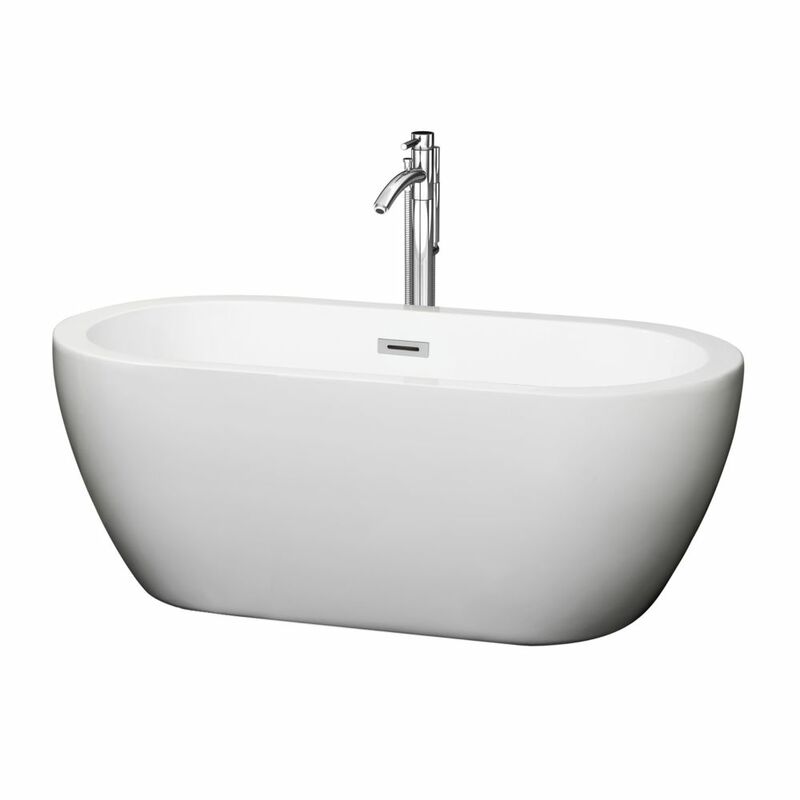 Stunning curves meet full-immersion bathing in the Soho 5 ft. Centre Drain Soaking Tub in White. Contemporary styling and soft lines contribute to the freestanding tub's modern aesthetic, sure to enrich your bathroom ambience and add a hint of serenity. This oval bathtub includes a floor-mounted single-handled chrome faucet along with chrome-finished overflow and drain outlets for a polished look. The acrylic construction is strong, light and warmer to the touch than typical steel or enamel tubs, allowing for easy installs and heat-retaining soaks. Deep enough for relaxing soaks yet occupying a small footprint, the Melody 5 ft. Centre Drain Soaking Tub in White is a superb choice for undersized bathrooms or confined spaces. Contemporary styling and clean lines contribute to the freestanding bathtub's modern aesthetic, sure to enrich your bathroom ambience and add a hint of serenity. The acrylic construction is strong, light and warmer to the touch than typical steel or enamel tubs, allowing for easy installs and heat-retaining soaks. It's surrounded by a flat ledge to keep candles, oils, salts and other bath accessories nearby. Overflow and drain outlets in brushed nickel are included to give this elegant bathtub a polished look. Soho 59.75-inch Acrylic Centre Drain Soaking Tub in White with Floor Mounted Faucet in Chrome Stunning curves meet full-immersion bathing in the Soho 5 ft. Centre Drain Soaking Tub in White. Contemporary styling and soft lines contribute to the freestanding tub's modern aesthetic, sure to enrich your bathroom ambience and add a hint of serenity. This oval bathtub includes a floor-mounted single-handled chrome faucet along with chrome-finished overflow and drain outlets for a polished look. The acrylic construction is strong, light and warmer to the touch than typical steel or enamel tubs, allowing for easy installs and heat-retaining soaks. Soho 59.75-inch Acrylic Centre Drain Soaking Tub in White with Floor Mounted Faucet in Chrome is rated 4.0 out of 5 by 1. Rated 4 out of 5 by Anonymous from Wyndham 5 ft. Soho tub It is not installed yet, but is looks nice, will let you know more when installed and use.